Loopool’s pressure is working. Whatever he is doing over there, my heartbeats and sweat pores are certainly reacting accordingly, vibrating with the alien rhythm that is oozing from this double CD album. What am I hearing? Loopool’s twisting world of ideas sounds like a writhing, living being, made out of the sounds of something between an orchestra playing underwater, sonar miscalculations and dark memory traces. How does all of this sound? “Unearthly” would be the first word coming to mind, and then words like “extremely” and “unsettling” would follow. “Loopool applies pressure” is a double album, with the second cd having one forty minutes long track on it. The vertigo-inducing sounds conjure electronic heartbeats and clicks at irrational rhythms, and after listening to most of the first cd, by the time you reach the track “Keymap to my heart”, you feel like you’re so far out in space that nothing would make any sense anymore. The simple, yet alien melodies are distorted and scorched to the point that all you can hear is their pathetic, yet persistent remains, who form together a different picture of powerful tones. 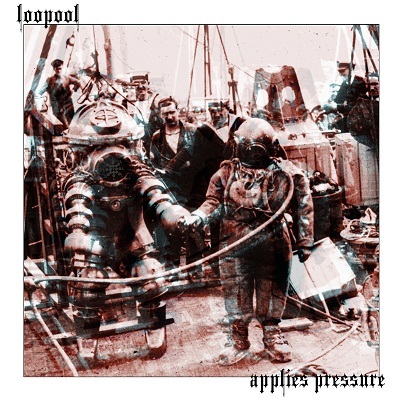 The hypnotic “Loopool applies pressure” is the best Loopool album I have heard so far. It hit the stomach and the brain with ill vibrations and haunting waves, to the point when all you can really do it immerse yourself and drown in it. Check this album out. I think it’s worth the nightmares you’re going to have later at night.